Um - if you have the money for a 580 ... pick up another $80-100 and get 2 x 6950 - you'll get nearly the best possible performance on the market at a similar cost. Also I agree that Nvidia will push the 580 price down as much as possible... the problem is that if you believe all of the admittedly "unofficial" breakdowns ... it costs Nvidia 1.5-2x as much to make a 580 as it costs AMD to make a 6970. "support for color correction in linear space"
There are two common ways to represent color, linear and gamma. Linear: Used for rendering an image. More generally linear has a simple, fixed relationship between X and Y, such that if you drew the relationship it would be a straight line. A linear system is easy to work with because of the simple relationship. Yet again we do not get to see hd 5970 in crossfire despite it being a single card! Is this an nvidia site? Anyway, for those of you who do want to see those results, here is a link to a professional Swedish site! 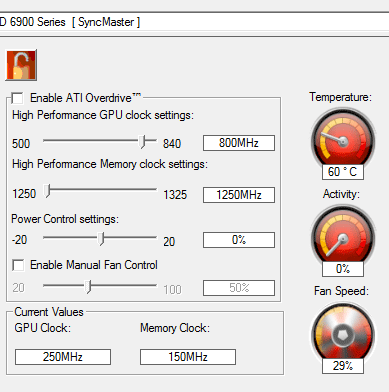 Wow, 5970 in crossfire consumes less than 580 in SLI. There's no way on God's green earth that Anandtech doesn't currently have a pair of 5970's on hand, so that MUST be the reason. I'll go talk to Anand and Ryan right now!!!! I'd like to note that I do not believe Anadtech ever did a test of two 5970's, so it's somewhat difficult to supply non-existent into any review. I was not aware of the fact that the 32nm process had been canned completely and was still expecting the 6970 to blow the 580 out of the water. Although we can't possibly know and are unlikely to ever find out what cayman at 32nm would have performed like I suspect AMD had to give up a good chunk of performance to fit it on the 389mm^2 40nm die. This really makes my choice easy as I'll pickup another cheap 5870 and run my system in CF. I think I'll be able to live with the performance until the refreshed cayman/next gen GPUs are ready for prime time. Ryan: I'd really like to see what ighashgpu can do with the new 6970 cards though. Although you produce a few GPGPU charts I feel like none of them really represent the real "number-crunching" performance of the 6970/6950. Ivan has already posted his analysis in his blog and it seems like the change from LWIV5 to LWIV4 made a negligible impact at the most. However I'd really love to see ighashgpu included in future GPU tests to test new GPUs and architectures. Gaming seems to be in the process of bursting its own bubble. Graphics of games isn't keeping up with the hardware (unless you cound gaming on 6 monitors) because most developers are still targeting consoles with much older technology.